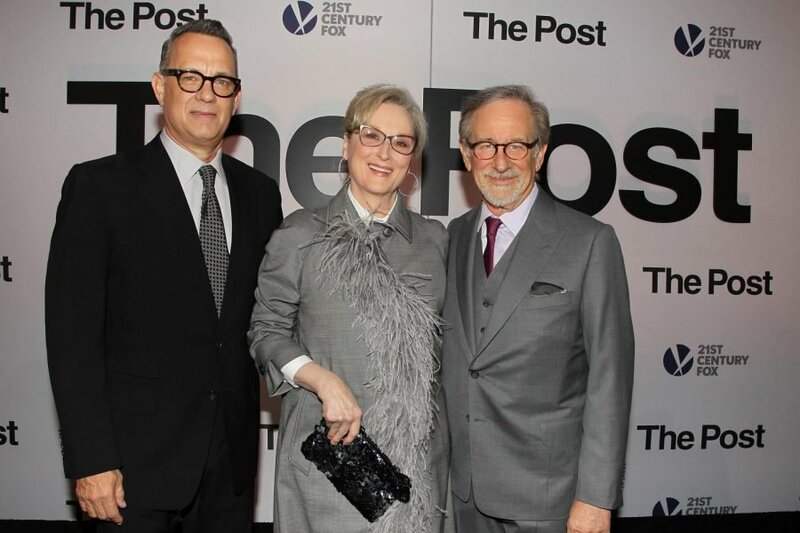 Tom Hanks (left), Meryl Streep and Steven Spielberg pose while promoting "The Post." The film tells the story of the Pentagon Papers. Spielberg was quick to respond. He said he felt it was important for this production to have a strong female influence, noting that the screenplay was written by a 31-year-old woman, Liz Hannah. This is Spielberg’s second foray into distinctly feminist films, the first being “The Color Purple” in 1985, 32 years ago. “The Post” recounts a pivotal moment in the history of The Washington Post when owner Katharine Graham decided to publish the Pentagon Papers. These papers were leaked, classified government documents that proved the United States administration knew the Vietnam War could not be won. Spielberg was in the middle of production for “Ready Player One” when he came across Hannah’s screenplay. Despite being swamped with work on the effects-heavy sci-fi movie, Spielberg was compelled to take on “The Post,” as the distinctly human, historic story resonated with him, he said. Spielberg said he felt the core of the story was incredibly relevant to the modern era, due to the similarities traced between former President Richard Nixon and President Donald Trump’s tenures in their efforts to stifle the First Amendment. Streep, who portrays Katharine Graham in “The Post,” said she also had a visceral reaction to Hannah’s script, and felt that Graham’s story needed to be told. As a rich housewife, Graham’s only societal expectations were to “make her husband comfortable, and her children as well,” Streep said. That all changed when Graham’s husband committed suicide, leaving her in charge of her family’s legacy publication. Graham’s decision to publish the Pentagon Papers came at a crucial time for The Washington Post, as the company was going public. Should the government have won in their Supreme Court case retaliating against the Post, Graham’s family’s legacy would have folded, and she and those involved in the publication of the Pentagon Papers could have faced jail time. Graham’s bravery was not lost on her, Streep said. “(Graham had) to make a pivotal decision that would affect the entire country and the progress of the government’s attempt to control the press,” she said. Streep added that “The Post” is one of the few films in her career in which she felt incredibly confident about her ability to tackle her role. Streep said she often enters productions with a lot of self-doubt, at times even attempting to pull out of the project entirely. She said she never felt tentative about this role, as Graham’s autobiography provided a wealth of perspective on her character. “I thought, what a wonderful woman, what an emblematic life and what a great opportunity to try to give her to the world,” Streep said. This project marks the first collaboration between Spielberg, Streep and Hanks, who plays the role of Washington Post executive editor Ben Bradlee. Streep said she enjoyed working with Hanks immensely due to his humor and wit on and off set. Hanks had equally high praise for his experience with Streep. “The Post” will be released in select theaters on Dec. 22, and nationwide on Jan. 12. The film has already garnered an overwhelmingly positive response from critics and audiences worldwide, scoring six Golden Globe and eight Critics’ Choice nominations. Spielberg, Streep and Hanks have all received nods for their work in the movie. Streep, who broke her own record for most Golden Globe nominated actress with a 31st nomination, agreed with Spielberg’s sentiments that Graham’s decision to publish led to “an explosion of faith in the free press” that would pave the way for Watergate. “Sometimes bad news makes good newspaper,” Streep said.